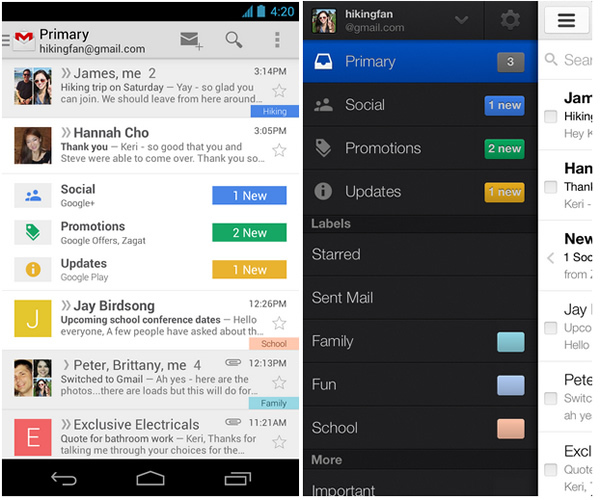 Google announced a new Gmail inbox for desktop and mobile few days back. The update is now started rolling out to Android users. The new inbox brings several improvements and new categories to organize email messages in Gmail. The desktop version is available for some users and the Mobile version also started rolling out to the public. It will be rolled out completely over the next few weeks, if you can’t wait you can grab a copy of the apk from the below link. You can wait for the official app update on your android device or get the below linked APK file of Gmail for android and install manually. To get the desktop version go to “Gear” icon on desktop version and click “Configure inbox”, select the categories you want and you are done. If you don’t see the configure inbox you have to wait.